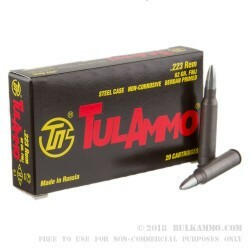 This is a fantastic price point on a 500 round case lot of steel cased ammunition that is imported from Russia for the .223 Remington by Russian importer TULAMMO. The production ammunition in this caliber has now gotten so good that many shooters, despite not liking steel cased ammunition very much, must finally admit the clear benefits of the round. For one, it is exceptionally cheap and easy to find relative to other ammunition at times. Additionally, the steel casing causes no harm to firearms, and has some of the most reliable performance in the entire caliber platform. It also shoots accurately enough, with 2-3 MOA on average out of average guns, and the potential for sub 2MOA out of nicely tuned firearms. That’s where it is important to understand the nature of the steel cased beast though, as it is not made specifically for ultra-tight tolerances and ultra-match type firearms. While it will achieve excellent results out of nice mainstream guns, it’s simply not made for guns at the top tier of manufacturing tolerances and premium performance match guns. Tula says you can expect around 3,025 feet per second velocity at the muzzle. 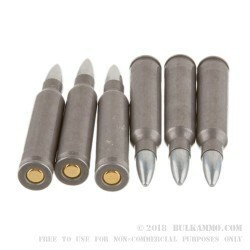 These rounds are loaded with a zinc coated projectile. A: No, these cases should not be reloaded. 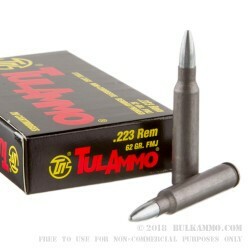 A: Yes, the bullets used for this Tula .223 ammo are FMJBT.